Garlic Escapes: Hello/Goodbye Telly Savalas! 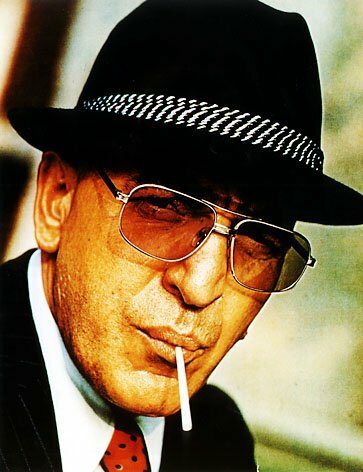 The irrepressible Telly Savalas (TV’s Kojak for those of you born in the 80s or God forbid, later) was born on January 21, 1922 and died on January 22, 1994. Born Arostotelis to Greek-American parents, Savalas’s character was famous for his love of lollipops and trademark quip, “Who loves ya baby?” His best friend was John Aniston (Jennifer's father) and Savalas was Jennifer Aniston's godfather. Honor his memory with these chicken “lollypops” accompanied by tzatziki (a traditional Greek sauce of garlic, yogurt, and cucumbers that I like to augment with salty feta cheese). To make lollipops, use a paring knife to cut around the thin tip of each chicken wing to loosen the meat around the joint. While holding the base, push the meat down gently to expose the bone and form a "chicken lollipop." Remove any flesh left on the thin end with a clean towel. Combine olive oil, lemon juice, garlic, herbs and seasonings in a bowl. 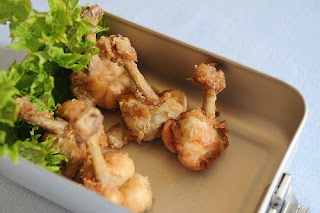 Add chicken lollipops and marinate at least one hour or overnight. Blend cucumbers, garlic, lemon juice, dill, black pepper (and feta cheese if you’re using it) in a food processor using the steel blade until smooth. Stir the blended mixture into the yogurt. Refrigerate for at least two hours before serving so flavors can meld.